These Crock Pot Italian Beef Sandwiches are done right, Chicago style! Each tender sandwich is infused with Italian seasonings and served on a hoagie dripping with juice and loaded with crunchy giardiniera! Not only are they perfect for serving a crowd, they are effortless to make with a crock pot! Warning – This sandwich is best enjoyed reminiscing about the ’85 Chicago Bears and waxing nostalgically about Mike Ditka. 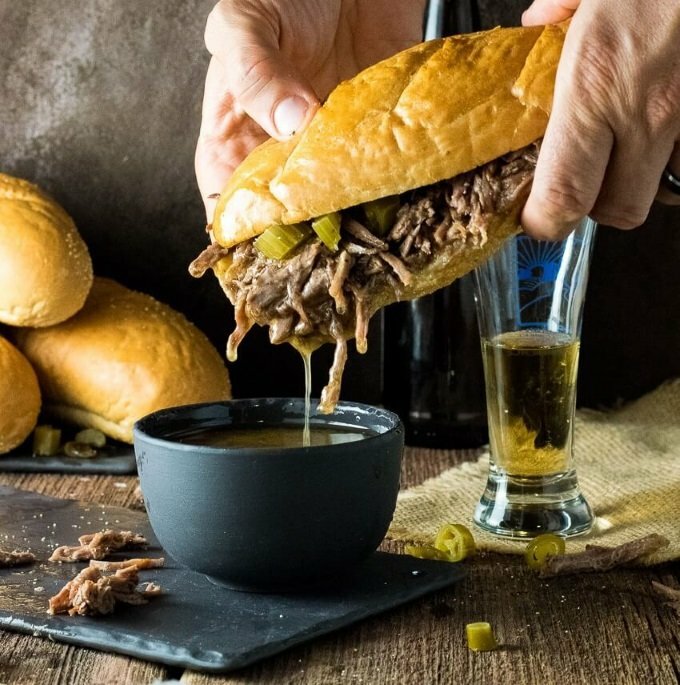 Actually, if da coach were a food blogger Italian Beef Sandwich recipes would likely be published each week, along with a buzzing Instagram feed of whatever William Perry is eating. What is a Chicago Italian Beef Sandwich? More than likely Chicago natives are ready to chastise me for using a slow cooker and shredding the meat for these sandwiches. If you are wondering what authentic Italian Beef sandwiches are, traditionally Chicago-style Italian Beef Sandwiches feature an oven roasted rump roast that is sliced thin with a deli slicer, then piled onto a hoagie roll, loaded with crunchy giardiniera, and dipped in the savory cooking juices! However, since I suspect most of you don’t have a home deli slicer, shredding these crock pot style is a worthy compromise. However, if you do buy a home deli slicer, get two and share with me. You’ll be my favorite reader for a day. The above links are affiliate links. 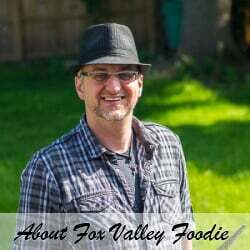 Any Amazon purchases made through these links help support FoxValleyFoodie.com at no additional cost to you! I have my recipe set to cook on high for four hours, however, you can certainly leave it on low and let it simmer all day. You don’t have to worry about crock pot Italian beef overcooking, it just gets more tender and flavor-infused. Since no Italian beef sandwich is complete without it, I considered including a giardiniera recipe with this post. However since it is a multi-day process to prepare, I figured that defeated the purpose of having an easy Crock Pot Italian Beef Sandwiches recipe. What Bun for Italian Beef Sandwiches? A classic Chicago-style Italian beef sandwich is dipped in the cooking juices so it is important your bun of choice can stand up to the liquid. An overly light and airy bun will quickly become saturated and begin falling apart. Instead, look for a slightly chewy hoagie roll, or French / Italian baguette, that can soak up the juice and still maintain it’s structure. 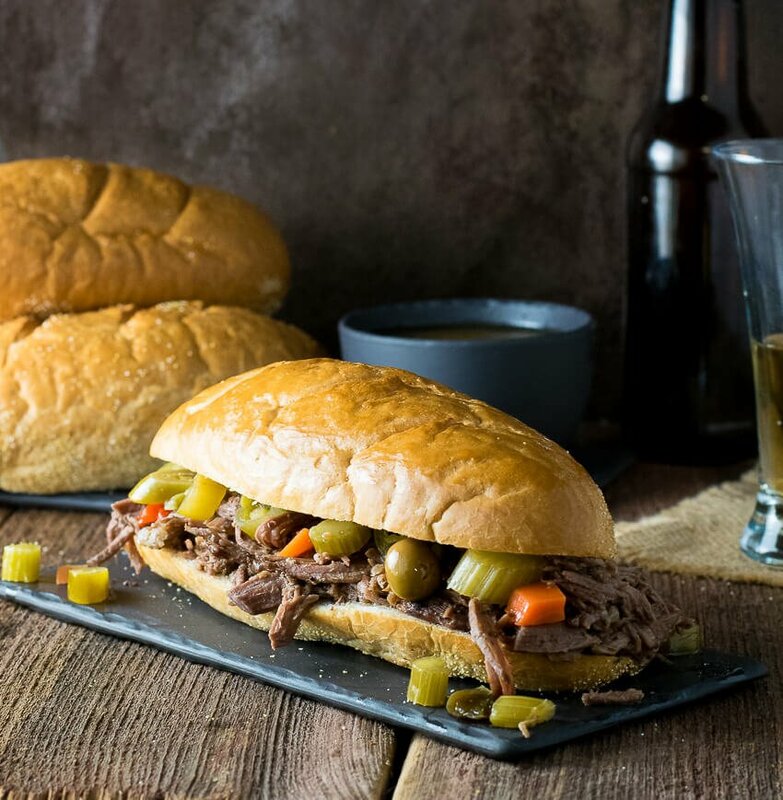 These Crock Pot Italian Beef Sandwiches are done right, Chicago style! Each tender sandwich is infused with Italian seasonings and served on a hoagie dripping with juice and loaded with crunchy giardiniera! Up to 1 tsp Salt to taste. Add all ingredients to crock pot and set on high. Cook 4-5 hours, or until easily shredded. This is meant to be a juicy sandwich. Either ladle out some juice to dip your sandwich in, or add the beef to the hoagie along with a generous splash of juice. Top meat with giardiniera and enjoy. 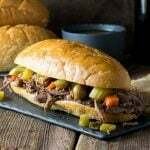 IF YOU LIKED THIS RECIPE then you will love the big flavors in my Crock Pot Mississippi Roast Sandwiches recipe too! Check it out, your mouth will thank you! 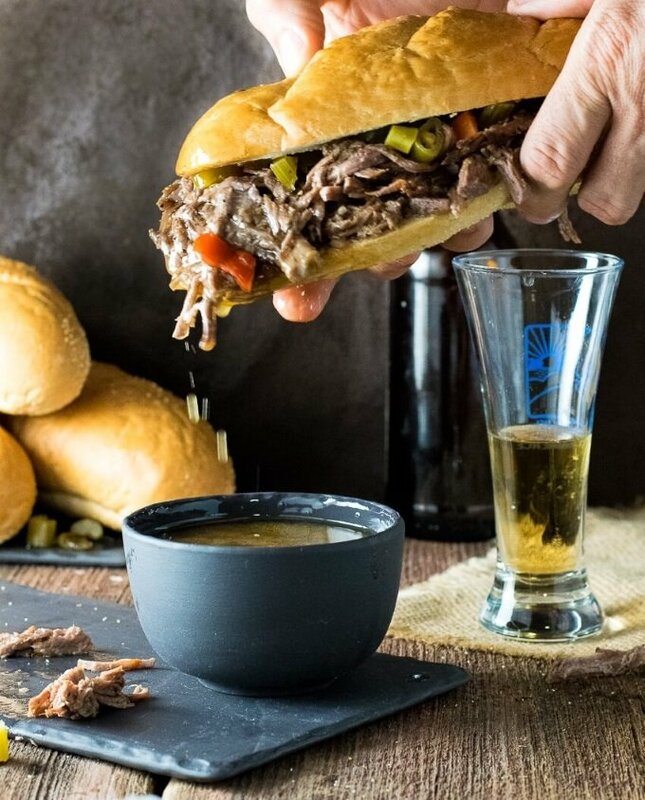 If you enjoyed my Crock Pot Italian Beef Sandwiches – Chicago Style recipe then you should probably like me on Facebook and follow me on Pinterest too. That’s what I would do at least, because if you don’t get to know me but you still use my recipe it is kind of like taking candy from a stranger, and your mom taught you not to do that. Don’t disobey your mom, subscribe to Fox Valley Foodie today. Thanks for the kind words. It is one of my favorite sandwiches! Your pictures are stunning. They make me wish that I could reach into my computer and take one of your delicious Italian beef sandwiches. I love Italian beef, this one sounds like a winner! This photo is fantastic, and I think the sandwich it brilliant. I want this for lunch now! *Insert GIF of Homer Simpson drooling* I just finished breakfast and I’m wishing this was my lunch! No need to be defensive about using a roast from a slow-cooker as the base for an Italian beef. I have done it (with a recipe similar to yours – omitting the Italian seasoning packets) and the results were fantastic. The reason it works is that the secret to a good Italian beef sandwich is to keep the temperature of the sliced beef low. If it reaches boiling, the meat shrivels and becomes tough. That’s why the slow-cooker is actually the perfect tool for a good Italian beef. You are really on to something here. Nice work! One thing I would change, based on my personal experience, is to remove the stems from the pepperonchini before putting them in the slow-cooker. It takes some extra work, but when the meat finishes cooking, it will break down into delicious tender pieces, and the inedible pepper stems have to be picked out. Great comment and good point! I updated the recipe to reflect that I used sliced pepperonchini, which eliminates the issue with the stems you mentioned. However, I agree whole pepperonchini would certainly work well too if the stems are removed. Thanks for the feedback! Cooking it on low would be advisable then…that is what Im doing today. It still only takes 5-6 hours and the meat is indescribably tender. I followed the directions perfectly and it came out tough and dry 🙁 any tips on what I should do next time? Keep cooking it in the slow cooker. Meat will never be tough when cooked in the slow cooker long enough. The longer it cooks, the more tender it gets. Slow cooker times can vary considerably depending on the meat. If it is too dry and you have to serve it quickly, adding more fat or liquid is a good fix. More beef broth is always good, but water is also a great substitution. Otherwise butter is an easily accessible fat. Though, in a quick pinch, bacon grease would be divine too! I have to say I found this recipe way too salty with the salty dressing mix and extra salt. Thanks for the comment, if you enjoy food with less salt there are lower sodium beef stocks you can use instead and also if you wait till the end to add the salt you can taste it first to see if it needs it. Fantastic recipe! My whole family loved it! We’ve had this twice so far and I have it in the crock pot again tonight for lunch tomorrow! I personally love salty foods so it is perfect! A little bit of shredded mozzarella topped with spicy giardiniera and you’ve got yourself and very yummy sanwhich! If we put the slow cooker on low, what would the time be? Or would you suggest only the high setting for 4-5 hours? It would work perfectly fine on low. Just cook it until it becomes easily shreddable. I don’t know exactly how long that would be, but I suspect 8+ hours(?). I made this over the weekend. The recipe was spot on but the cook time of 4 hours was way off. I ended up closer to 9 hours. But once I got there it was great. Thanks for the feedback. I’m glad you liked the recipe. Can I assume your 9 hour cook time was on the low setting? Can I use bottled Italian dressing? My Mother in law made this for my family last week. It was incredible. Even my picky son loved it. I’m cooking it up right now for dinner tonight. Thank you for sharing the recipe! Best recipe for a party! It’s easy, feeds a crowd and everyone wants the recipe before they leave! I’ve tried it with rump roast and with chuck roast, with one season packet and two and it’s great either way. You can’t go wrong with this recipe! Thank you! I’ve made this twice and am serving it tomorrow for a crowd! Thank you!! We’re new to the Fox Valley and were not overly impressed with the area restaurant versions. This was perfect. We’ve also used other beef roasts with this recipe and served the beef as chunks over rice with broccoli on the side. Do I cook on low/medium/or high for 4-5 hours? As written the recipe calls for cooking on high, but you can certainly use low or medium instead, it will just take a few hours longer. What a wonderful and easy recipe. The meat comes our perfect. I made a modification by leaving out the Italian dressing packets, since I did not have them at home, and diced up and sautéed a white onion, 3 cloves of garlic and a red bell pepper.I also added 1/4cup of the 1/4 cup of the Peperoncino liquid. This might have to go in my weekly rotation! This recipe was amazing- made it last night and loved it. Cooked on low for 8 hours and was perfect. But it does make a lot. Can you freeze leftovers? could this be made in a Cast iron Dutch Oven? How many hours/ temp? Absolutely! 325 degrees until tender should do it. Figure about 3 hours, but stay flexible and keep cooking until it becomes tender. i feel compelled to comment on this. i lived in chicago for a few years and my husband grew up there. when we think italian beef, we think portillos. so when i saw a recipe for chicago style it beef, that was what we were expecting. cooked on low all night in slow cooker, it was tender, howevr the pepprocini peppers made it too hot and inedible for my husband. i would advise leaving them out. it was probably good but i have to admit it is so spicy , i almost cant eat it and i like peppers. its a shame . Would you consider sharing your giardineria recipe? I am willing to take a couple of extra days to make it if you have a great recipe! Thanks. I considered creating a recipe for it, but I haven’t gotten around to it yet. When I get it completed I will update this recipe. Ive made this in the crocpot cooking on high abd ut us dekicious and a famiky favorite. What would the adjustments be to make this in an Instant Pot? Unfortunately, I have not attempted this recipe in the instant pot. This was Wonderful! Every picky male eater in the house loved it. However for myself I need to reduce the salt somehow. I’ll tweek that next time I make it. I cooked mine on high for about 5 hours. My slow cooker doesn’t cook real hot. It was very tender.